If you have read my About page or Hello widget you can see I mention right away we love gardening and remodeling our home. In fact one of the reasons I started this blog was create a space to document and share a few big home improvement projects that have been slowly working their way up our to-do list. When we bought this house four years ago it had a lot of features I was happy with (location, space and privacy in the yard) and two major ones I wanted to change right away (dark brown paint and a rickety, narrow front porch). In our first year we put on a new roof and finished two interior rooms but the really big items on my “must have” list have had to wait… until this weekend when they finally reached official planning and scheduling status. Our project got a jump-start last summer when the Utilities District let us know our large Cedar Trees in the front yard were too close to the power lines and needed to come down. They gave us a fair amount of money to use towards replacement plants but losing these trees meant we had to rethink the entire yard since what was once an established shade garden is now sitting in full sun. 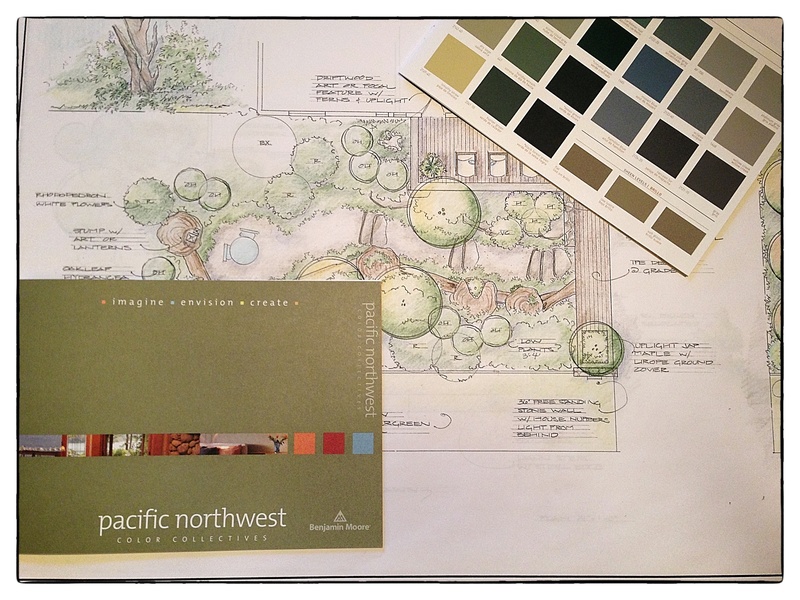 We talked through our ideas over the winter and this spring hired a Landscape Architect to help us with a new comprehensive plan. We are also working through the measurements for a new porch, deciding on door styles to convert our car port to a garage, selecting more decorative window trim and finding the perfect house colors. It is going to be a busy summer but I can’t wait! Every few weeks I plan to post photos, including some really awful before shots, and if all goes well we will have a finished project with a lot more curb appeal by fall. Happy birthday. I see you are now into ads – potato chips and beer. Good for you. Looking forward to seeing your renovation updates. You all have such great taste! Thanks, it is going to be fun! I’ll be sure to update the pictures here so everyone can follow along! We have renovated one home and I think learned just enough to know this one is going to take a lot of work. 🙂 I can’t imaging doing four! What fun, and so good when it’s all done! It’s the wallabies that are driving our garden makeover… much as I love them, they’ve taken to eating all sorts of things I like to grow, so we’ve extended fences and now we’re replanting. Pretty unlikely, in your part of the world! You’ll have to make the trip across the Pacific one day…or maybe a zoo has wallabies? It’s a looooong flight, but worth it. We thought so when we went the other way!